Paris had never been a place that called to me. Perhaps it's because it's the place to go in Europe. Or perhaps it's because it's expensive. Or perhaps, just perhaps, a bit of the "French versus American" drama had seeped into my psyche as a little girl growing up in America. Or it may very well have been the disastrous year of French classes I took in college. Whatever the case may be, Paris never called to me. But when Tim and I discovered we'd have a 7.5 hour layover in Paris on our way home from India, a small germ of an idea started to grow in our minds. We had never taken advantage of long layovers before – anyone who reads HedgehogsWithoutBorders knows we prefer to travel slowly and without too much stress or planning – but this time something felt a bit different. Sure there was still the risk we'd miss our flight, anytime you leave the airport during a connection there's that chance. 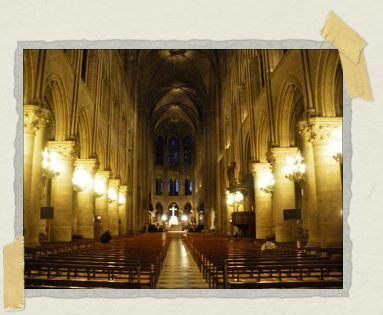 But this time, particularly given the great public transportation in Paris, there was overwhelming evidence that we could leave the airport, visit some sights, and return to the airport with plenty of time to spare. And so we did. Of course we had a few things working in our favor, otherwise your two traveling hedgehogs would never have ventured away from the airport. Our time in customs was quick, around three minutes total. We were already ticketed onto our next flight, which meant the only line we'd have to face when we came back to the airport was the security line. We had no luggage to carry, checked or otherwise. We had printed out directions and maps for the Paris metro before we left Cape Cod. We had also researched which metro ticket option would work best for us. We had US dollars to exchange for Euros in case our ATM card didn't work in the airport. And we knew how long a taxi would take in case the metro workers went on strike (which we read they enjoy doing) while we were in town. Our flight from Delhi landed a few minutes early, just shy of 6am. We breezed through customs without as much as a look, we grabbed 80 Euros from the ATM for the few hours we'd have to explore, we managed not to think how far 80 Euros would have gone in India, and we purchased two Paris Visite metro day passes. And so it was that we made our way from the comfort of the amazingly gorgeous Charles de Gaulle airport out into the cold night of Paris. Our ride into Paris was under cover of night. It wasn't until we reached just inside the city limits that dawn broke and revealed the same graffitied buildings found throughout all cities around the world, apartment buildings with quaint balconies just as you imagine Paris would have, and a bundled population making their way to work early that Wednesday morning. Our original goal that morning was to make our way directly to the Eiffel Tower. After all, with only a few hours to spare in Paris, what would be more quintessential than some photos in front of that monument? But we realized the metro stop where we'd be making our transfer was named Saint Michel-Notre Dame and the name woke us from our slumber ("Isn't there a church named Notre Dame?"). We emerged from the Parisian underground and found ourselves next to the River Seine and in front of Quasimodo's cathedral. Given we were ahead of schedule (we had budgeted for customs to take an hour, not three minutes), we headed into the cathedral. Looking up at its gorgeous walls and vaulted ceiling, I felt a bit of dejá vu: aside from being a big larger, the National Cathedral in Mexico City felt very much the same way. We made our way slowly down each side of the church, noting that lighting candles to saints in Paris is quite the expensive affair. (Each candle costs 2 Euros for your saint-of-choice, except for the Virgin Mary: her candles cost 5 Euros each.) It was early so there were few other visitors and it felt like much of the church was meant just for us. And as we continued to admire the art and architecture, the sound of a priest's lyrical voice leading his small congregation danced over the stone pillars. Leaving the church, we were greeted with the views of Parisian streets and small cafes; again, exactly as you would imagine there to be. (We were also greeted with the distinct smell of urine which amused us greatly – we were so thoroughly warned of the smells we'd encounter in India, never really having found them. 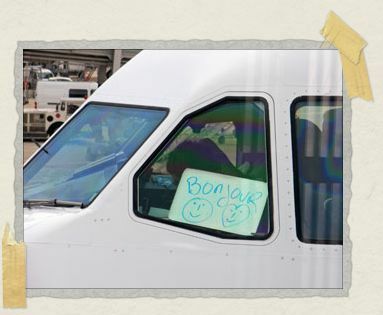 We had no idea they were simply waiting for us in Paris!) And with no pressing agenda in mind, other than to perhaps make our way toward the Eiffel Tower, we began walking along the left bank of the River Seine. 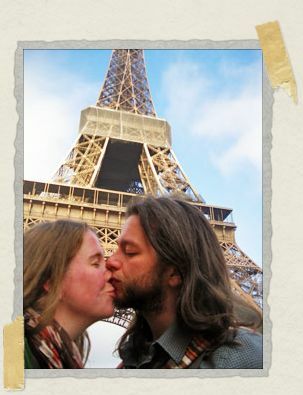 Prior to the start of our honeymoon, we had virtually no time to research anything about Paris. Aside from the metro map and a few basics, we were going by instinct ("I have to imagine the Eiffel Tower is that way") and interest ("This is a gorgeous river, let's walk alongside it") alone. One thing we did have time to check on before leaving was the weather. We knew that Paris would be somewhere around 40-50 degrees when we were there; a far cry from the 90-100 degrees we had in India. But given we'd only be in Paris for a few hours (as opposed to a few weeks in India), we couldn't bring ourselves to pack any warm weather gear. Grabbing the comfortable travel socks Turkish Airlines had given us on our flight from Istanbul to Delhi, we put them on....our hands. And we pulled them up as far as they would go, a point which proved just short of our elbows. The extra layer of warmth helped considerably and we continued as such – two American tourists with dark blue socks up to their elbows – along the River Seine for quite some time. 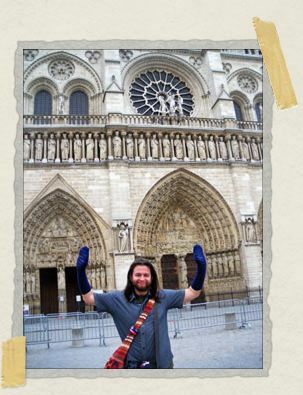 As we walked together, it was difficult not to realize how much Paris was calling to us. Particularly because we had so little time to spare, the little streets that navigated away from the river were appealing. We wondered what tiny shops and cafes and picturesque views would be found just around the corner. But we had to relegate ourselves to enjoy the river and the buildings next to it alone. Given there are some marvelously gorgeous buildings next to the Seine, including the Louvre, it wasn't such a bad place to be. Our time in Paris was ticking away, but we still had nearly two hours to spare. And it was just about this time that we saw the most adorable and the most Parisian looking cafe just across the street from us. Making our way over to it (while stealthily stashing our sporty blue socks), we decided a small breakfast was in order. Like the Eiffel Tower, what better way to celebrate being in Paris for a few hours than over café and croissants? Entering the cafe felt like entering another world: the dark wood of the high bar, the carefully scattered tiny tables, the sound of French being spoken. Even the small dogs, belonging to one of the local patrons, who came over to greet us with a proper sniff and a friendly wag of the tail were exactly as I imagined it would be. Making ourselves comfortable at a cozy corner table, we ordered two cafés, a petit dejeuner, and a sampler of cheese presented on a cutting board. We spent the next hour praising each of the many cheeses laid before us, all the while cuddling the dogs who would come over for pats on their heads. We watched the foot traffic pass by. We saw jauntily dressed soldiers on horseback saunter past. We giggled when the dogs raced out of the cafe (after the horses) and came back safely again when their owner yelled "Attention!" But mostly we just soaked in the feeling of being in a Parisian cafe. Leaving the cafe wasn't something either of us wanted to do, but it was made easier because we agreed we'd most certainly be returning to Paris after all. 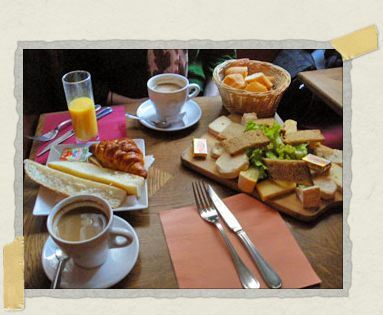 (Despite the fact, it should be noted that our breakfast in Paris cost as much as one of our fancier rooms in India!) And so we continued along the River Seine (sans socks, it was warmer by then), detouring now and again for a few photos, until we found ourselves at the next metro stop. Glancing at the map, we realized we still had a bit more than two-thirds of the way to go before reaching the Eiffel Tower. Glancing at our watch, we realized we'd never make it on foot. And so down into the metro we went on our way to our last sight in Paris. A few minutes later found us at the feet of one of the most popular monuments in the world. Glancing straight up, I could feel why folks are so taken by it as we watched the clouds kiss the top of the tower. It really is the "stuff" that black and white movies are made of. And although we didn't have time to walk the length of the Champ de Mars for the iconic view of the tower, we treasured the time we had at its base. Snapping a few photos, we kissed and wished one another a happy honeymoon. And then, as quickly as we arrived, it was time to head back to the airport for our flight home. Paris wasn't quite done with us yet, though. Perhaps just to make sure we didn't forget our time there, or perhaps just to ensure we'd return again one day, a few buskers performed on the metro rides back to the airport. While listening to the uplifting notes of songs being played by old accordions, we yet again passed by the streets of Paris, the apartments with their small balconies, and the graffitied buildings. And Paris, most certainly, began to call to me. Did you know that the Paris metro lines are separate entities so you can have a strike on individual lines instead of the whole thing at once? Usually though one line will go on strike and a couple of others will strike in sympathy. LOL! I didn't know that actually. Thinking about it, I'm guessing that's similar to what happened when we were there too (i.e. only a few lines went on strike rather than the whole thing). Normally the line we were taking from the airport would have gone all the way into town to our transfer station…but instead it stopped just inside the city limits and we had to get on another line to take us all the way in. Too funny. Oh I so want to go to Paris one of these days not just to see the Eiffel Tower but to to to the Lourve(sp? 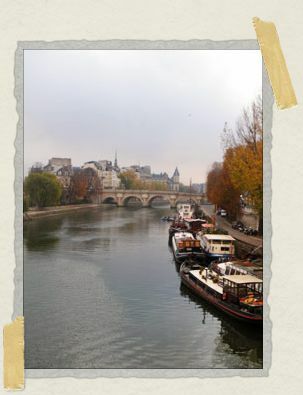 )and walk along the river Seine. I'd have to take Jane with me as she speaks French fairly well and she has been to Paris before. Oh just talking about Paris makes me crave baggutes with good cheese on them and some nice Crossants with good coffee. Le Vie En Rose is plaining in my head. To quote a line from Sabrina "Paris is always a good idea." To quote a line from Sabrina "Paris is always a good idea." We enjoy quoting lines from Sabrina to one another too. It's always been one of our favorite movies.